Digital security has never taken on greater urgency. Today we live in a fundamentally connected ecosystem where we increasingly work, play, and indeed live most of our lives online. Whether we are enterprise users or endpoint consumers, our digital experiences are increasingly delivered to us on our connected devices - wherever we are, whenever we want them. For InfoSec professionals, this interconnected ecosystem is wreaking havoc with the idea of "the perimeter." In fact, the perimeter as we know it no longer exits. The attack surface is always shifting and continues to disperse across a wider area. At the same time, attacks continue to grow in size and volume, and are increasingly targeted. No longer can you secure the perimeter and trust that nothing will get in or out. What you need to deploy and manage is being redefined right before your eyes, with or without you. 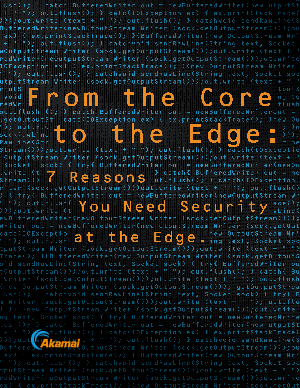 You need to take security to the edge.